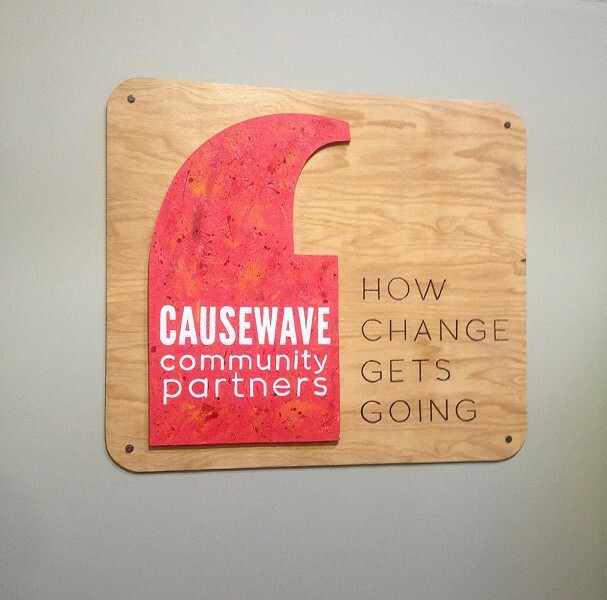 PHOTO BY REBECCA RAFFERTY The Rochester Advertising Council has rebranded as Causewave Community Partners. Rochester Advertising Council announced today that it has rebranded as Causewave Community Partners. This is the first time in 65 years the non-profit, which helps increase the visibility of non-profits, has changed its name. "The organization known for 65 years as the Advertising Council of Rochester is finally taking the advice that we've been giving non-profit organizations for decades, which is to align our brand with the role we want to play in this community," said Todd Butler, President and CEO of Causewave Community Partners. "Instead of a name that focused on just one tool that we have in our arsenal, we needed a name that made it clear that we were all about helping causes to build momentum," he says. The re-branding also includes a new logo for the organization, in the form of a symbol that serves a dual purpose: The image can be seen both as a tall, solid red wave rushing forward, as well as the beginning of a quotation mark, "that shows the voices and the perspectives of the many people who we do our work and collaboration with," Butler says. Causewave Community Partners has also initiated a hashtag campaign, #jointhewave, for members of the community to share on social media things they do to volunteer or otherwise improve the Rochester community. Editor's note: This article has been updated to describe Causewave Community Partners as a non-profit. The organization is not an ad agency.